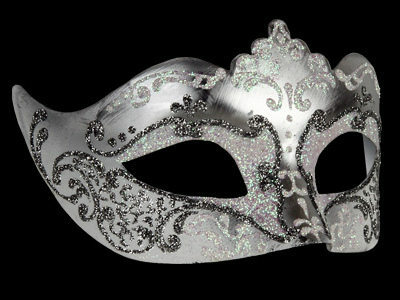 Elegant, romantic and filled with sparkle, this Stella Masquerade Masks - Silver White will take every womans breath away. Showcasing true glamour, this beautiful design features a high-impact colour and extreme quality silver & white base that's filled with the most breathtaking hand painted white & silver swirl embellishment. This stunning party mask design makes the perfect accessory for your masked ball. Delightful ladies Venetian masquerade mask with black satin ties from extreme comfort & security. This masquerade mask is perfect for your next party, wedding, prom night or Venetian ball and FREE UK Delivery.